Some people love to entertain and try new recipes. My daughter is one of those people. She and her family are surrounded by the best neighbors in the world….really, I am not kidding. They all get along so well, and there is always some sort of a party going on. They all have such great ideas for parties, which brings up all sorts of new recipes to taste and to experiment with. I also benefit from these events, as I volunteer to babysit my granddaughter, and sample these wonderful foods. 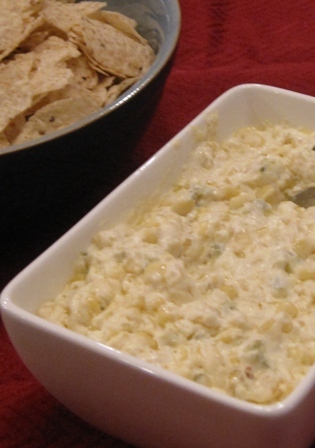 Today I will share a recipe for a really scrumptious Jalapeno Corn Dip, which I love just as much as the popular Buffalo Chicken Wing Dip, I posted previously. I bet you will love it as well, and everyone will ask for the recipe!!!. All you have to do is to tell them to visit my site, suburbangrandma.com , and spare yourself the trouble of writing it out…..:-) thanks. Melt the butter in a pan on a stove top. Add corn, and mix well. Stir in the Jalapeno Peppers. Add cream cheese to mixture, and stir until melted and creamy. Season to taste with salt and cayenne pepper. Serve with Tortilla chips, or corn scoops. This dip is best served warm, so a small, 1-2 qt. crock pot, is just the perfect size. Uhhhh….I bet the “Queen of the kitchen” will bask in the glory of compliments from her guests!!! Looks Delish! I will give this a try for sure! 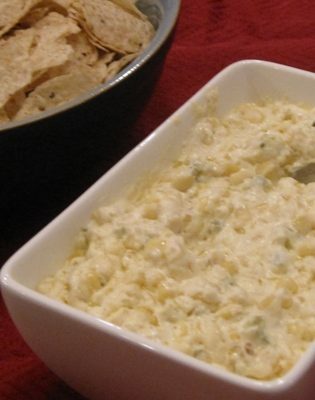 This dip is very addictive….you will not stop after your first dipping….. honestly. We enjoy your company at our neighborhood parties too! Love your website! I admire your talent and your craft ideas!!! You are welcome to post them on my site, anytime. Yeah but how much is 6 oz of jalapeños? I bought mine in a 6 oz can. If you are using fresh jalapeno, then you should use your own discretion on how hot you want your dip to be, thus how much jalapeno’s to add in. I hope this helps.